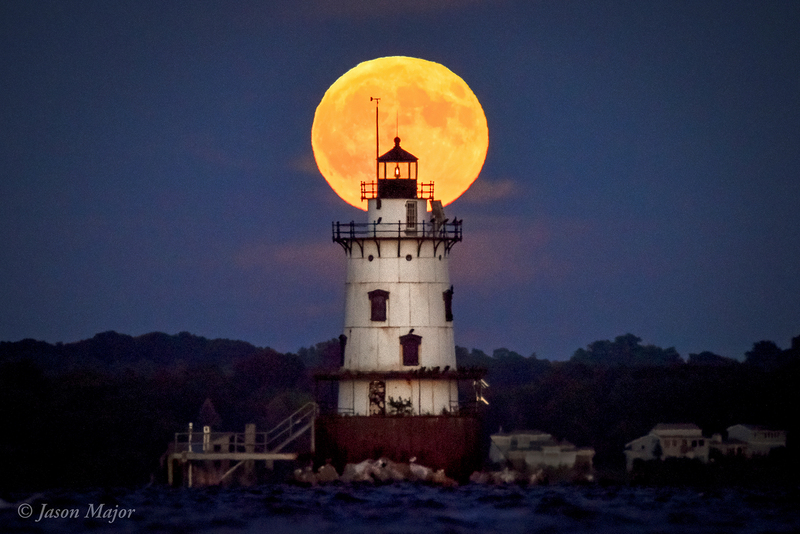 Full Moon rising over the Conimicut Point Light in Warwick, RI. Sept. 16, 2016. © Jason Major. You’ve probably heard the news or read the headlines: the full Moon on November 14 will be a “supermoon,” and in fact the biggest and brightest one since 1948 and until 2034. But what does that really mean and what can we expect to see in the night sky? Supermoon is really just a dramatic name for a full Moon that occurs at or near the time when the Moon is also closest to Earth in its orbit – a point called perigee. This doesn’t always occur but it’s not at all unusual either…astronomically, it’s not a big deal. 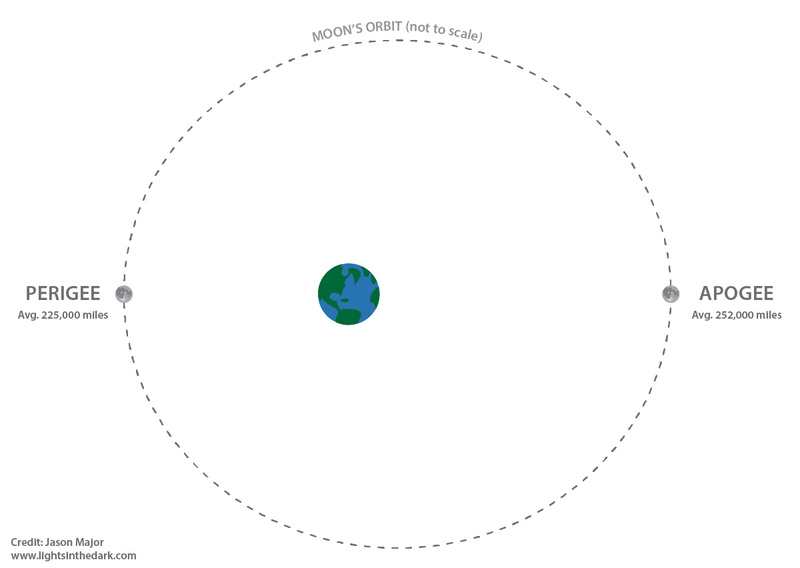 The Moon’s orbit around Earth isn’t a perfect circle with Earth in the center; it’s offset and oval-shaped (and at a 5.14º tilt relative to Earth’s orbit around the Sun) so the Moon’s distance from Earth is always changing a little bit as it travels along its 27.3-day-long orbital path. When the Moon is farthest from Earth, it’s at apogee; when it’s closest, it’s at perigee. Every month has an apogee and perigee Moon, even though they don’t always coincide with the full and new phases. The average apogee distance is about 252,000 miles away, perigee is usually around 225,000 miles. But even these distances differ on regular cycles; over the years they themselves vary slightly. So just as one month’s perigee can be a little closer or farther away than another month’s, the closest perigee of a given year can be the closest within a given span of years. This is what’s occurring on November 14, 2016. At 11:24 UTC (6:24 a.m. EST) on Nov. 14 the Moon will be at a distance of approximately 216,500 miles (that’s an edge-to-edge measurement), which is the closest the Moon has been to Earth since Jan. 26, 1948. It won’t come that close again until Nov. 25, 2034. It will coincidentally reach its fullest phase about two and a half hours later. Read more about the November 2016 full perigee supermoon on WPRI meteorologist T.J. Del Santo’s weather blog here. So what does that mean for us? Other than perhaps some very slightly stronger tides in some coastal areas over the next few days, not much. Yes the Moon will be closer but the difference of size in the sky as compared to a “regular” full Moon will be pretty much imperceptible – just a few percent larger. And even though a closer, larger Moon does mean an increase in apparent brightness, again it’s hard to tell the difference. After all it’s not like there’s anything else to compare it to in the sky! For the record, the Moon is always the same size in the sky over the course of an evening. It’s just an illusion that it’s larger near the horizon, and the photos you see (like mine above, taken during the Harvest Moon in September 2016) are forced perspective relying on a telephoto lens to bring distant objects closer, thus making a rising Moon look comparatively huge. So should you go out and look at the supermoon on Monday or even Sunday, since it will be about as full during prime viewing times then too? Yes, of course! (This is what I’ll be doing.) 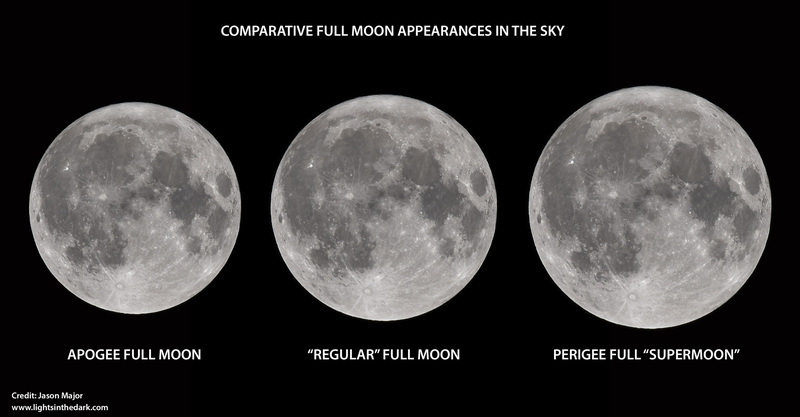 The Moon is always beautiful to look at, perigee, apogee, super or regular or otherwise. And it’s fun knowing that it’s just that much closer to us…closer even than it’s been since there’s been a lunar space program! (Or even NASA for that matter.) But don’t expect the sky to be filled with the Moon or look like something you’ve never seen before… it really will be hard to tell the difference. Want to learn more about perigee Moons and how the orbits work? Check out this article on Universe Today by David Dickinson. 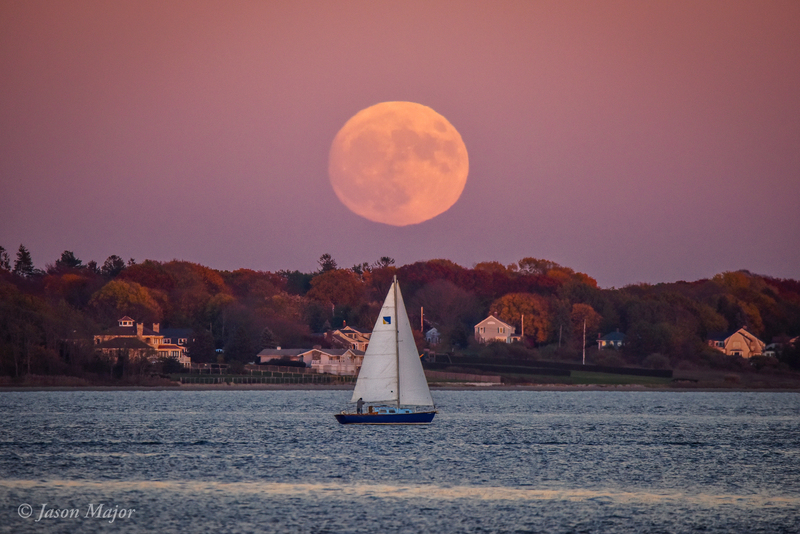 ADDED NOV. 13: Here’s a view of the nearly-super almost-full Moon rising above East Providence in Rhode Island, captured from Conimicut Point in Warwick—the same location where I got the lighthouse photo in September but looking a bit more north, as the Moon’s location in the sky has shifted over the past couple of months. Previous Post More Moons For Uranus? Next Post Space Geek Gift Alert: The Year in Space 2017 Calendar!